Beet Juice: How does it work? We’ve written in the past about some of the exciting studies surrounding a pretty unexciting product: beet juice. Several sources have found that a shot of the nitrate-reach beet juice could possible improve endurance and power in athletes when taken a few hours before a workout. And, thrilled by the idea of a legal, non-stimulant, completely healthy performance enhancer, many athletes from various sports have stocked up on beet juice shots. Beyond athletes, though, some patients with high blood pressure have started asking their doctors if they should start taking beet juice as well. All of this hype is based on the theory that beet juice works by expanding your blood vessels, thereby decreasing blood pressure and increasing the amount of nutrients that can reach your muscles – fueling them for more activity. A new study from Penn State University, though, questions this theory. First off, let’s be clear: This study was not designed to test the performance-enhancing benefits that have been reported from beet juice. Instead, the researchers were trying to investigate the exact mechanism that causes those benefits. As mentioned above, it was previously thought that the high concentration of nitrates in beets led to an increase in nitric oxide – a vasodilating gas that has become a popular preworkout supplement over the past few years. In this study, however, the team measured the amount of blood that flowed through the brachial artery in the forearms of their subjects during grip exercises. Surprisingly, there was no change in the the width of the artery when the subjects were given beet juice. The researchers were careful to note, though, that this lack of dilation was not caused by a lack of absorption. Basically, this means that the nitrates in beet juice do get absorbed and do get converted into nitric oxide. But, for whatever reason, it does not result in the vasodilation that everyone expected. Interestingly, the beet juice did result in a beneficial softening of the arteries which can result the risk of cardiovascular disease. The researchers did note that the results of this study were limited by the test group. The subjects use here were young and healthy, with very healthy cardiovascular systems. This shows that beet juice likely does not act as a vasodilator in athletes. However, the study did not look at older individuals, or those with per-existing cardiovascular conditions, so more research is necessary to see if the juice could be useful in a clinical setting. Also, the exercise intensities used in the study were limited. It is possible that higher intensity activities would have gotten different results. So this study does not necessarily debunk the use of beet juice as a performance enhancer but it does show that the juice probably does not work the way everyone thinks. Remember, the study did not even look at athletic performance. If you have taken beet juice in the past and benefited from it, you aren’t doing yourself any harm. The juice is a rich source of micronutrients that can surely improve various facets of your health. More Fuel is the Key to Racing? I found this study fascinating. I’m always trying to figure out the proper balance of nutrition during a marathon–how much is too much? Sometimes I find myself hungry during a race and have obviously let my tank get too empty, but I worry I will take in to much and cause stomach problems. But that may not be the case…Now it looks like I need to fuel more. A new study published in the International Journal of Sports Nutrition and Exercise shows aggressive fueling may be the key to optimal performance. Researchers recruited runners training for the 2013 Copenhagen Marathon and told them to finish a 10K time trial about seven weeks before the race. Runners were grouped into pairs based on speed. From each pair, one runner used the fueling strategy developed by the researchers, while the other was told to fuel however he or she wanted. All runners completed a half marathon five weeks before race day and so everyone could practice their particular fueling strategy. 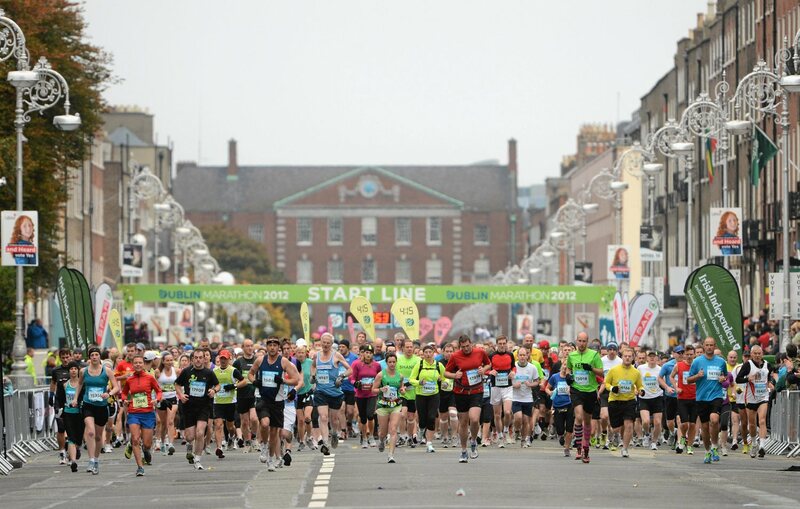 In the 2013 Copenhagen Marathon, the 28 runners who were using the fueling plan ran an average of 4.7 percent faster than the 28 who didn’t. No one reported gastrointestinal issues–which to me, is the most curious result of all. You’d think the opposite would be true, but I was pleased to discover that’s not the case. Each runner on the scientists’ fueling plan took in about 25 ounces of H20 and three High5 EnergyGel Plus gels per hour. Each of these gels contains 30 milligrams of caffeine, a known performance enhancer. High5 EnergyGel is not available in the U.S., so to replicate the study, look for a gel that contains caffeine and more than one type of sugar (glucose, fructose, maltodextrin, etc.) If you are not a caffeinated beverage drinker, this much caffeine may have poor results and give you the shakes. Try to ease into it. In several past posts, we’ve discussed the use of caffeine when it comes to athletic performance. For the most part, though, we’ve only looked at general information. Thanks to some newer research that has emerged since those posts were typed, we can now get a little specific. Primarily, we want to look at appropriate dosages of caffeine for and how you can properly manage your caffeine intake for optimum results – and limited side effects. Let’s just get this out there: Caffeine is a drug. As with most drugs, your body will eventually form both a tolerance to – and dependance on – caffeine. Thanks to the dependance, you will crave caffeine and experience withdrawal symptoms when you go without it. But your brain’s ability to form a tolerance means that you will consistently need more and more caffeine to feel the same effects. For many people, this is knowledge enough to make them totally cut caffeine out of their lives. But the truth is that numerous studies have proven that caffeine can be incredible useful to athletes competing in an number of sports. The stimulant has been shown to improve power output, endurance, mental focus, reaction time and the metabolism of fats. The trick, then, is to find a maintenance dose of caffeine that will allow you to enjoy the benefits without developing a tolerance and dependance. Since caffeine effects people differently, depending on a variety of factors, it’s difficult to come up with an exact dosage. According to many experts, though, dependance is unlikely to occur when your daily dose hovers around 100mg of caffeine every day – equivalent to about one 8oz cup of coffee. Again, though, this may not be true for everyone and some studies have observed withdrawal symptoms after discontinuing even this small dose. It may take some experimenting to find the sweet spot for you – the lowest possible daily dose of caffeine that allows you to feel the benefits without being totally hooked. If you’re really willing to dive in and make some serious sacrifices to get your coffee habit under control while discovering your optimum maintenance dose, you might think about a two-week taper. To start, pick a two week period that seems like it will be relatively low in stress and estimate your normal caffeine intake – including coffee, tea, soda, energy drinks and anything else you can think of that contains even small amounts of caffeine. Each day, gradually decrease the amount of caffeine until you’re down to just 100mg. Maintain this for a few days and then – when you’re ready – cut out all caffeine for three days. You will probably experience headaches and other withdrawal symptoms. After a few days, though, these will fade and you will totally free of your caffeine habit. At this point, you can resume 100mg or less of caffeine every day and you should be able to exercise more control over your habit. So far, though, we’ve only covered daily use. Once you find your lowest possible baseline dose, you can start to use caffeine as a performance enhancing supplement. In most studies, the optimum dose is calculated as being ~3-6mg of caffeine for each kg of body weight. Which means you’ll have to do some math. Sorry. If you’ve found your ideal daily dose and it’s relatively low, you should be able to make due with just 3mg/kg. To keep yourself from developing a tolerance while using caffeine in this way, only boost your dose on training days and only when you feel like you need it. Some days you may be feeling great and not need any help, other days may be different. Strictly speaking, coffee is not the best source of caffeine. The exact amount of caffeine found in the coffee will depend on a huge number of factors, including brewing method, filter type and the quality of bean. If you really want to be precise, you might consider a caffeine pill or powder that has a specific dosage. In less than two weeks, the Patriots will meet the Seahawks on the Gridiron for the Holy Grail of football games: The Superbowl. Did you watch the Seahawks game yesterday? What an amazing comeback and rally by the team. Repeat drill 4 x of 5 minutes tempo run and then 2 minutes interval run. You can come back to the same speed on the tempo run, but always try to go faster on the interval speed. Interval: 800m with 200m pickups (go faster every 200m). You need to pace yourself to get faster at the last 200m. Stretch at end for 10 minutes to help with lactic acid. Reverse: jog up and speed race down. Immediately race back up and jog down. As athletes, we tend to focus primarily on physical stress – the way that our daily lives and our training affects our bodies. Unfortunately, the tendency is to largely ignore the mental aspect of this equation. In reality, mental stress can have a huge impact on your health and physical performance. Short bursts of the so-called “stress hormone” cortisol are a natural part of your body’s fight-or-flight response and are intended to suppress certain biological systems that are not absolutely essential in an emergency situation. While this changes everything from your immune system to your reproductive system, the impact of real interest to athletes is what cortisol does to body composition. Just in case you’re going to need it down the road, cortisol tells your brain that it’s time to start creating – and holding on to abdominal fat. At the same time, cortisol triggers a state of catabolism which causes your body to breakdown muscle for fuel. While this happens on a small, nearly undetectable scale nearly every day, when cortisol levels are chronically high – as can happen through extended physical and/or emotional stress – body composition and athletic performance can be severely affected. Of course, there are tons of different techniques to manage stress out there. A recent study published in the journal Psychoneuroendocrinology looked specifically at something called “dispositional mindfulness” – the ability to be aware of your experiences in an accepting and nonjudgemental way. Specifically, the researchers were curious as to why two people can experience the same level of self-rated mental stress and yet have such varying physiological responses to it. For four mornings, the group of 43 female subjects were asked to describe their levels of perceived stress, anxiety and negative feelings. The researchers also asked the women if they were able to accept the negativity without judgement. Perhaps most interestingly, the researchers also monitored the subjects’ cortisol levels within the 45 minutes after waking up. Once the data was compiled and analyzed, it became clear that the women who were more articulate about their thoughts and emotions had lower cortisol levels then those who had difficulty expressing and accepting their internal experiences. Of course, this is just a preliminary study – limited by the use of self-reporting and small sample size – but it still proves an interesting point: The key to managing stress is not avoiding negative thoughts altogether. Instead, we have to learn to process these emotions in a healthful way. A related study out of Brown University also found that dispositional mindfulness can improve your overall health, even reducing markers of cardiovascular disease. Unfortunately, this is not a skill that comes easily to everyone. Many people find it difficult to simply experience negative thoughts or emotions, rather than fighting them. With practice, though, this habit can be changed through meditation and mindful exercise. Apart of these disciplines, however, there haven’t been a lot of options for people wanting to improve their dispositional mindfulness. Interestingly, a study published in Mental Health and Physical Activity compared the impact of both relaxation training and aerobic exercise on the mindfulness of 149 men over 12 weeks. Surprisingly, the relaxation group saw no improvements in dispositional mindfulness. 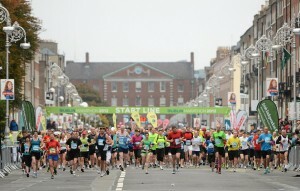 The aerobic group, however, did – lending support to the idea of running to clear your head. Learning to process emotional stress, instead of ignoring or rejecting it, can help to reduce the severity of cortisol spikes and improve your overall health. While there are many ways to do this, sticking to your routine of cardiovascular training could be a big step. Of course, if that isn’t doing it for you, you might try a mindful exercise style like yoga or Pilates. Breast Cancer Walks. I try to participate in charity races as a way to see my registration dollars go to important non-profits and make me feel like I’m working out for the greater good and for something so much bigger than myself. Each October, I try to find a breast cancer walk/run and I am never disappointed in the aid stations. Men often man these aid stations and dress up in womanly attire to promote this female-oriented cause. With curlers in their wigs and underwear worn on the outside of their clothes, these men give the walkers/runners a laugh and a warming of the heart. Themed Aid Stations. From costumed heroes to saloons complete with cowboys and entire painted backdrops, I love enjoying the creativity of fun-loving volunteers as I run past. Sometimes I find myself laughing so hard that I lose my energy. It’s worth it! Great Wall of China Marathon. 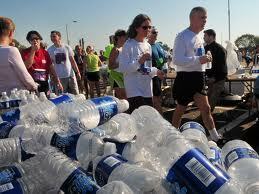 Because good, clean water is a precious commodity in China, every aid station served entire bottles of water. The volunteers didn’t open up the bottles and pour them into small cups; rather, they handed all runners the entire bottle at each and every station to avoid any contamination. Unfortunately, it was challenging to get water bottles up the Wall due to their weight. So at mile 21 and 22, no water existed. This left runners crawling around on the Wall searching for any tossed-to-the-side bottles that contained any ounce of water left in them. Quite a sight! 12K’s of Christmas. 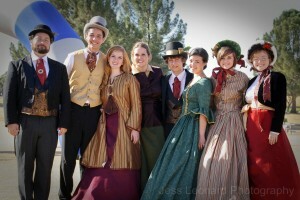 In Gilbert, Ariz., just outside of Phoenix, the annual 12K’s of Christmas occurs each December. As a treat to runners, choral groups serenade each runner at every 1K marker. From children dressed as snowmen, to professional singers donned in old-fashioned suits and dresses, this race forced me to remove my earbuds and feel the holiday spirit resonate from one kilometer to the next. To be honest, you likely already knew that your favorite fast food haunt wasn’t doing you any dietary favors. It’s no secret that we should all be limiting our frequency at these establishments if we want to keep our weight down and our bodies functioning properly. But, after a wave of negative press during the late 1990s and early 2000s, many fast food chains seemingly made an effort to improve their image. During that time, a series of documentaries and investigative news features exposed the unsavory – and often unethical – nutritional practices of these establishments, leading to a huge dip in popularity. The situation didn’t improve for them when governmental agencies began to move against the use of trans fats in fast foods. This particularly unhealthful form of fat was in just about every item on many restaurants menus and a highly publicized overhaul quickly began. Then, of course, there was a barrage of criticism over the often ridiculous portion sizes offered – some would even say “encouraged” – by these chains. In response, McDonald’s even dropped their trademark Supersize option in 2004 – although, the chain claimed it was only done in an effort to simplify the menu. So, with their newer, healthier images fast food chains are still a major part of the American diet. The question arises, then, are they actually any better for us after these changes? In two reports, researchers at Tufts University compared the portion sizes and nutritional make up of three large fast food chains between 1996 and 2013. Specifically, the team looked at the composition of fries, cheeseburgers, grilled chicken sandwiches and regular colas. Despite all of their efforts to make it seem otherwise, the data is clear: Fast food chains have done little to improve their menus. The one notable exception was the sharp decline in the use of trans fats – but only in fries. For the most part, this was directly related to legislative action taken between 2005 and 2009. Trans fats are still alive and well in many other options, though, including burgers and milkshakes. Even when trans fats did slowly make an exit, however, the food as a whole didn’t really improve all that much. The total calories and sodium content remained remarkably high. Depending on the restaurant, a single cheeseburger could supply you with as much as 63 percent of your recommended daily sodium intake. Add fries to that and you’re up to 91 percent of your allowed sodium for the day. Of course, it’s not completely surprising that fast food is still unhealthy. What is off-putting, though, is how little things have changed and just how unhealthy these restaurants still are. In fact, some chains even feature menu items that cram about 1000 calories into one single sandwich. For the average person, that’s about half the daily allotment. In one sandwich. Drinks are still woefully large, too, and a single beverage intended for one person could contain as much as 800 calories. A complete fast food meal, then, with burger, fries and a drink could run as much as 1750 calories. That means that that one meal could account for about 88 percent of a 2000 calorie per day diet. Again, this isn’t really news. But the point is that, despite their well-designed marketing campaigns that try to argue otherwise, fast food restaurants have not really changed their menus. Although no expert in food trends, I spot apple cider vinegar mentions popping up in magazines, websites and in e-newsletters delivered to my inbox. I think it may be the newest health craze…and for good reason. In a recent study conducted in Japan, 175 obese individuals took either vinegar or water for 12 weeks every day. At the end of the study, those who used vinegar had lost weight. On average, the vinegar group lost one to two pounds throughout the three months. 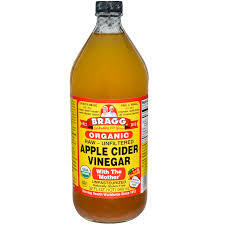 Apple cider vinegar has also been known to help with diabetes and blood sugar control. In fact, ingesting vinegar helps block some of the digestion of starch, keeping blood sugar lowered. But don’t drink it straight from the bottle. Dilute one to two tablespoons into a glass of water and slowly sip with meals. It’ll help with digestion and possibly constipation. Keep healthy in 2015 with this recipe! 2. Boil garlic and ginger in 2 cups apple cider vinegar for 4 minutes. 3. Add 3 to 4 cups of water and 4 tablespoons of honey to the pot. 4. Cool and drink. Make sure to drink (eat) the garlic and ginger- very IMPORTANT! Add more honey or water if desired. Tho, you want it nice and tangy. 5. Drink 1 cup twice daily- or more if you can handle it. Not to be used if on blood thinning meds (i.e., Warfarin/Coumadin). Not be used if you have a recent TIA, stroke, or heart attack or are on potassium sparing drugs (i.e., spironolactone). Use sparingly if nursing or pregnant (not to exceed one cup daily). Well, here we go again. New Year’s. The topic of resolutions is flooding websites, talk shows and magazines right now, with everyone discussing what they want to change and how they’re going to do it. But, as you’ve doubtlessly read in myriad pessimistic articles, the vast majority of resolutions fail. In fact, the official statistics claim that only 8 percent of people actually follow through on their resolutions. And, since most resolutions have to do with health and fitness, this is of particular interest to us. What follows, then, are some basic tips you can use to keep your New Year’s Resolution. The primary downfall of resolutions is that are simply not well-planned goals. As we’ve discussed in previous posts, the American Council on Exercise likes the S.M.A.R.T acronym for proper goal design. This means that good goals must be specific, measurable, attainable, relevant and time-bound. So, simply saying “I’m going to lose weight,” doesn’t pass the test. While it is absolutely measurable and attainable, none of the other criteria is satisfied. A much better goal would be “I’m going to lose 5 pounds in a month.” This meets all the requirements to be a SMART goal. The is an incredible amount of just plain bad advice available to you. It’s everywhere. For example, last week we covered a recent study that exposed the startling amount of false information being spread by means of popular and trusted medical TV talk shows. Often, it’s well-meant. But, perhaps just as often, it’s intended to sell you something. Either way, it’s important to be picky when deciding who to listen to. Not only could following faulty advice impede your progress, it could even serious harm to your health. If you decide to work with a trainer, don’t be afraid to ask about their credentials since it’s very common for people to work as personal trainers with no education or certification in the field. When it comes to diet advice, though, even more caution is necessary. Everyone has an opinion on what constitutes a “healthy” diet and what works for them may not work for you. For accurate personalized dietary advice, seek out a registered dietician. Whether its a trainer or a dietician, having a trained professional on your side can be a huge motivation for you to stick to keep your New Year’s Resolution – especially if you’re paying them. Another issue, closely related to the SMART requirements discussed earlier, is that many New Year’s Resolutions are last minute, emotional decisions. There’s no planning behind them, nothing to support them and no real, lasting neurological connection to them. And, while that last bit might sound a little ridiculous, consider this: Healthy eating and exercise are habits. Behind the scenes, habits are nothing but reinforced thinking patterns that form new neural pathways. After about 18 to 21 days of repeating a behavior, these new patterns become hardwired into your brain and form habits. Keeping your resolution, then, is a matter of sticking to it for close to a month and retraining the way that your brain functions. This requires discipline and planning.